The mission of the Division of Animal Resources is to provide a high level of animal husbandry care and veterinary services to assist the faculty of this institution in their research endeavors involving animals; to ensure that all applicable laws, policies, and standards of animal care and use are met by the institution; and to serve as an asset to the research program of the institution. Division offices are located in the Medical School Building in room 9-307. The LSU Health Shreveport Animal Care and Use Committee (ACUC) is a standing committee of the institution which is responsible for the oversight of the institutional animal care and use program. The committee is created and empowered by the Animal Welfare Act of 1966 (P.L.98-544) as amended by the Animal Welfare Acts of 1970 (P.L. 91-579) and 1976 (P.L. 94-279 and the Food Security Act of 1976 (P.L. 99-198); Public Health Service (PHS) Policy on Humane Care and Use of Laboratory Animals as depicted in the Health Research Extension Act of 1985 (P.L. 99-158); and the U.S. Government Principles for the Utilization and Care of Vertebrate Animals Used in Testing, Research, and Training. The committee ensures that all animals used in research, teaching, and testing are used appropriately and are treated in accordance with the highest standards of humane care. The ACUC is appointed by the Institutional Official and consists of 21 professional people representing various departments within the institution. They include 12 scientists, 2 Doctors of Veterinary Medicine, 3 community members, and 4 ex-officio members. The ACUC is responsible for reviewing all animal use protocols, ensuring compliance with federal regulations, inspecting animal facilities and laboratories, overseeing training and educational programs, investigating reports of potential noncompliance with regulations and taking corrective actions as necessary. Prior to working with animals, personnel must be listed on the applicable animal use protocol, must be enrolled in the institution’s Occupational Health Program, and must have completed the institution’s training program on the use of animals in research. According to NIH Guidelines for Research Involving Recombinant DNA Molecules Section IV, the Institution shall establish an Institutional Biosafety Committee whose responsibilities include specifying practices for constructing and handling recombinant DNA molecules. However, this committee need not be restricted to recombinant DNA. Its responsibilities may include organisms and viruses containing recombinant DNA molecules and other chemical and biological hazards. The Institutional Biosafety Committee (IBC) is responsible for reviewing, approving, and overseeing all projects performed at LSUHSC which involve biological materials that are a potential hazard to investigators or research subjects. The IBC meets on the 2nd Thursday of each month. If there are no new protocols or revisions to be reviewed, an email meeting will take place. Committee review and approval of annual updates are done annually. The Principal Investigator (PI) must gain the approval of the Institutional Biosafety Committee to proceed with research that utilizes infectious agents/biohazards, chemical agents and recombinant DNA. PIs can have only one active protocol at a time. The PI is responsible for notifying the IBC of any changes to his protocol. If a PI needs to add or make a change to his protocol, he may submit a memo to the committee requesting the change. If the scope of the research is changing, then the PI must submit a new protocol and request to terminate the other. The PI is responsible for renewing the Biosafety protocol each year by submitting an annual update. Support staff for the LSUHSC-Shreveport Institutional Review Board (IRB) are located in the Clinical Research Building. The Human Research Protection Program (HRPP) staff work closely with the IRB and are also located in the Clinical Research Building. The risks to the subject are sufficiently outweighed by the benefits to the subject and the importance of the knowledge to be gained as to warrant a decision to allow the subject to accept those risks. The rights and welfare of the subject are adequately protected. Legally, effective Informed Consent is obtained by adequate and appropriate methods. As defined by federal regulations, IRB authority extends to any study using live human subjects, data, and tissue collected from live humans. It is also an institutional policy that IRB approval must be obtained to collect and use in a study any tissue from a cadaver when that individual had been identified before death as a person from which tissue was needed for a research study. Review and approval of all radioisotope user projects for compliance with license restrictions and university policies and regulations. Assuring that project proposals do not impose unacceptable radiological risk to individuals. Review and approval of radiation producing equipment when requested by the purchasing department. Assuring that University personnel involved in the control and handling of radiation hazards, including project director and technicians, have appropriate training and/or experience. Reviewing the actions of the Campus Radiation Safety Office. The HRPP was accredited by the Association for Accreditation of Human Research Protection Programs (AAHRPP) in June 2009 and reaccredited in June 2012. The goals of the HRPP are to provide education and community outreach regarding use of human subjects in research. The IRB is part of the HRPP. The Office of Research is located on the first floor of the Biomedical Research Building (BRI), Rooms F1-50 and F1-51. The staff in this office oversee the review process for intramural grants, coordinate operations in the research space in the BRI, keep the financial accounts for the Office of Research and the Office of Graduate Studies and oversee undergraduate and summer student research programs. The Office for Sponsored Programs and Technology Transfer (OSPTT) provides services to faculty and staff at LSU Health Shreveport involved in the acquisition of sponsored projects and technology transfer. OSPTT’s mission is to promote the Institution’s goal to increase the level of sponsored project funding, to protect the interests of the Institution and its faculty and staff, and to provide the highest degree of support services. LSU encourages and expects its personnel to engage in creative, scholarly activities as part of their duties. All LSU personnel are required to bring to the attention of an appropriate LSU officer, at an early date, any discoveries, inventions, and works potentially subject to legal protection under patent, copyright, or other law. The inventor, the inventor’s department, and the inventor’s campus gain prestige, and in some cases, financial benefits from commercializing an invention or discovery. Such commercialization is consistent with, and complementary to, LSU’s academic mission. All intellectual property (IP) generated from Federal, State, and Foundation funds is the property of LSUHSC-S. The Office for Sponsored Programs and Technology Transfer (OSPTT) accepts disclosures and facilitates their review. The OSPTT works closely with staff in the LSU System Office for further development of IP, including patent applications, licensing options, etc. Ownership of IP generated from Scientific Research Agreements is negotiated on a case-by-case basis, depending on the intent of the program. All intellectual property generated from clinical trials agreements is the property of the pharmaceutical company sponsor. LSU does not have any ownership to this intellectual property, as outlined in the pharmaceutical clinical trial agreement. Identifying potential funding sources for investigators; funding announcements posted on OSPTT website as well as notification through email system. Grant management, including annual progress reporting, re-budgeting, grant close-outs and facilitating the transfer in/transfer out of awarded grants to LSUHSC-S, upon faculty relocation. Negotiating and facilitating the execution of sponsored research agreements, material transfer agreements, confidentiality agreements and LSUHSC Prime Awardee federal subcontracts. 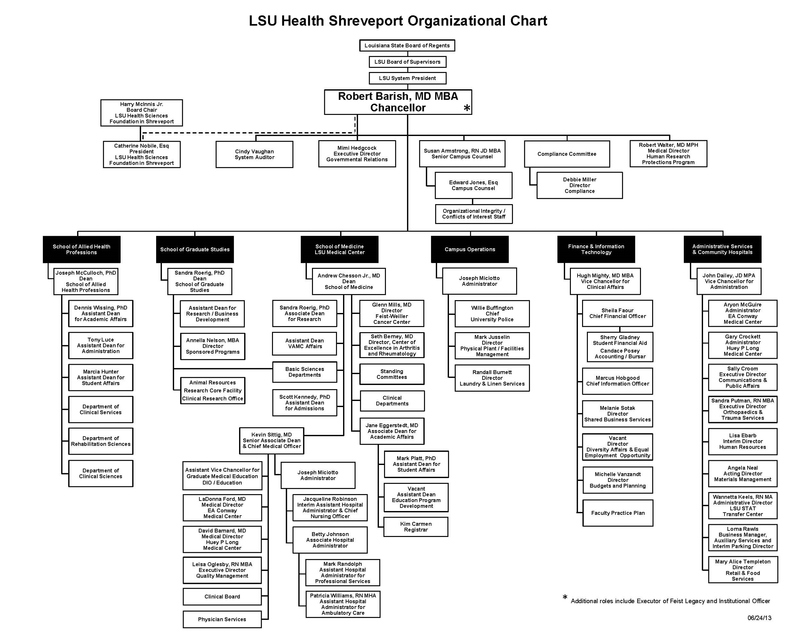 Under the LSU System Policy, inventions developed at LSUHSC Shreveport or its entities must be disclosed to LSUHSC-Shreveport. An invention may be any new and useful process including medical devices, composition of matter, or related improvement. The process of invention begins with conception of the invention, and continues with successful licensing and commercialization of technology transfer. In order for an invention to be patentable it must have utility (be useful), it must be novel (new and original), and it must be non-obvious to one of ordinary skill in the field. An invention may also be a copyrightable creative work. To disclose an invention, faculty must complete a Technology Disclosure Packet. The disclosure form collects important information about the invention. The form also includes an Assignment Agreement that is required as well. Once the packet has been submitted to OSPTT, the PI will be given a Revenue Distribution Agreement to complete. The disclosure is then sent to a group of faculty who will review the disclosure and make recommendations as to whether to request more data, file a patent, or not approve the disclosure. LSUHSC-S is engaged with professional consultants for review of our technologies as to their relevance to patentability, marketability, and commercial value. LSUHSC-S works to maximize the commercial value of institutionally supported technologies. The Research Core Facility is located on the sixth floor of the BRI and on the ninth floor of the Medical School Building, 1501 Kings Highway. The sixth floor facility, located in Rooms F6-12, F6-13, F6-14, F6-15, F6-48, F6-50, and F6-51, contains an Automated Cellular Imaging System, Confocal Microscopy, DNA Array (Chip) Analysis, Flow Cytometry, Fluorescence Microscopy, Laser Capture Microdissection, Mass Spectrometry-Proteomics, DNA Sequencing and Real-Time PCR. Four fulltime staff members operate these instruments and provide technical support. A computer laboratory in the Research Core Facility runs software packages specifically designed for the available technologies. The Small Animal Imaging Facility located on the ninth floor in the Medical School Building includes a MicroPET, MicroCT, MicroPET/SPECT/CT, and fluorescent imaging systems. A full-time veterinarian and full-time research associate operate this facility. Services are available on a fee basis.